The Oakwood Gardens Apartments is part of Kim Wilson Housing, a 501 c (3) organization that operates with a mission to work collaboratively to develop housing options for persons with special needs or disabilities. 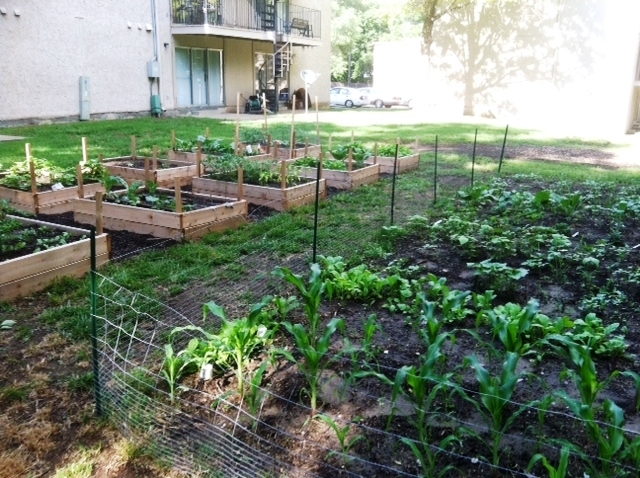 The community garden is one way to provide residents with an opportunity to learn how to successfully garden and improve their nutrition. Ten plots are available for area residents to rent. A 300 sq. ft. communal garden is utilized for group gardening projects. Gardeners have participated in gardening workshops and garden walk tours so they can expand their gardening knowledge. Grant funds were used for site preparation, compost bins, tillers, wheelbarrows, garden tools and equipment, fruit trees and workshop expenses.